Did you know that on April 22nd it is Earth Day? Earth Day Canada “leads an annual Earth Day campaign in conjunction with free, year-round, award-winning programs that get people of all ages outside, interacting with the natural environment — this, in turn, fosters an intrinsically motivated, enduring commitment to stewardship and conservation.” Earth Day should not just about the day, but it is a springboard for making eco-friendly choices all year round. Did you know? Residential dwellings contribute more to global pollution than industry does. Although this fact is hard to swallow, it also means that we have the power to change our world!!! I love being part of Norwex because it is a Company that promises to create a brighter future for your Family, their Consultants and our PLANET. Did you know? 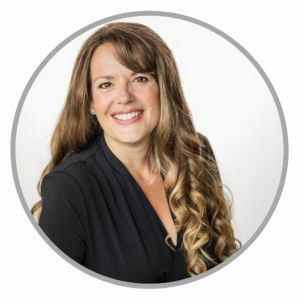 Norwex has a Norwex Movement, spear-headed by Norwex’s CMO, Amy Cadora. It is committed to joining together to create a chemical-free environment by making small, conscious choices and becoming educated about our world. The Norwex Movement accomplished their first goal to donate to a non-profit, community-based organization “Washed Ashore” whose mission is to educate and raise awareness about marine debris and plastic pollution through art. Read more about “Washed Ashore” here. I have learned so much from being a member of the Norwex Movement and I encourage you to join this worthy movement. A great way to start your environmentally-friendly journey (or continue along) is to host a Norwex Party. It is a great opportunity to gather friends and family to learn about all-natural cleaning/personal products, learn methods to reduce your cleaning time by 75%, learn how to reduce the amount you spend on cleaning products and have the opportunity to earn FREE Norwex product. 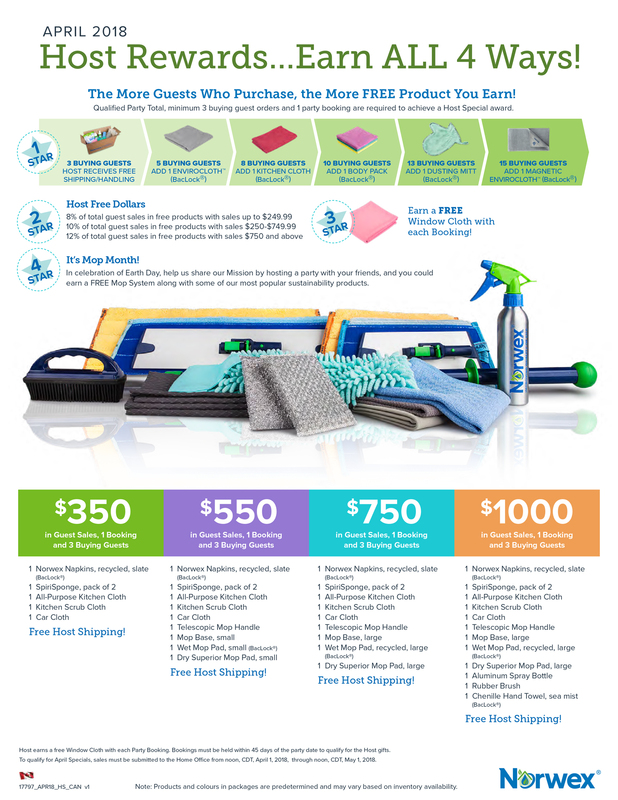 The Norwex Host Rewards Program is fabulous and incredibly generous. The rewards change every month (THIS MONTH IS MOP MONTH… WooHoo!) and there is the opportunity to earn lots of FREE product. I call it the 4 STAR Rewards or 4 ways to earn FREE Product and they are all based on 3 criteria: Amount of Guest Sales, Number of Buying Guests and Number of New Bookings. 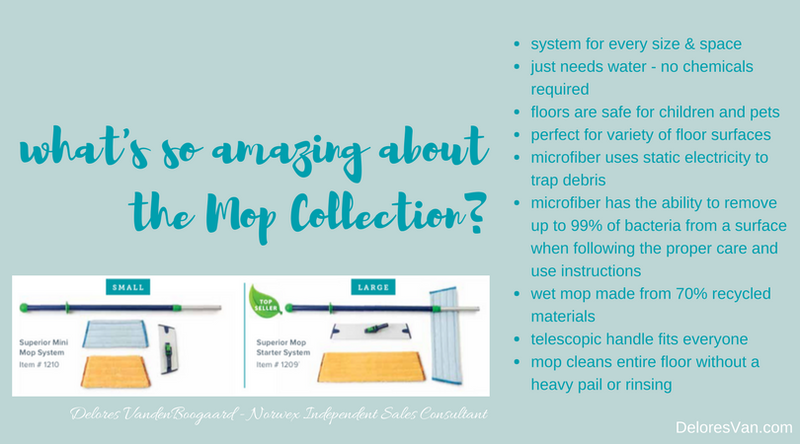 If you have always wanted the Superior Mop Collection (worth more than $125.99 and includes both the large and small bases), you want to reduce your environmental footprint in this world, while improving your quality of life, keep reading and host a party! The first reward is all about the Number of Buying Guests! Invite everyone you know… the more, the better. Hosts are sometimes nervous about the number of guests who will attend. But don’t worry, I always suggest inviting all your family and friends, from near and far (Norwex ships right to your door). It is a gift to invite those you love… a gift of improving their quality of life by learning how to clean without chemicals. The beauty of the Host Free Dollars is that you get to choose your own reward (products). I suggest you write yourself a Wishlist of products to fulfill this reward. With each new party booking, you will receive a FREE Window Cloth. They are the best polishing cloths around! Each cloth is made of tightly woven Norwex microfiber containing exclusive Baclock™ agent. This micro-silver agent in the cloth, goes to work with self-purification properties against mould, fungi and bacterial odour. It is perfect for glass, windows, mirrors, granite countertops, brushed and stainless steel appliances, etc. You will never need window cleaner again! These are a relatively new product that address the need for less disposable products like napkins. Did you know? On average, a family of 4 uses more than 3000 paper napkins per year. That is a lot of paper. Norwex Napkins are constructed of microfiber with their exclusive Baclock™ technology, plus they are made from 50% recycled materials or the equivalent of 5 – 500 ml plastic bottles to help clean up our environment. These napkins are convenient, have self-cleaning properties and are reusable!!! This checkerboard patterned Kitchen Scrub Cloth is specifically designed to tackle hard-to-clean jobs in the kitchen… like dirty pots and baked-on food. It is also tough enough for cleaning the bathroom… perfect for removing stubborn soap scum and grime from the bathroom surfaces. 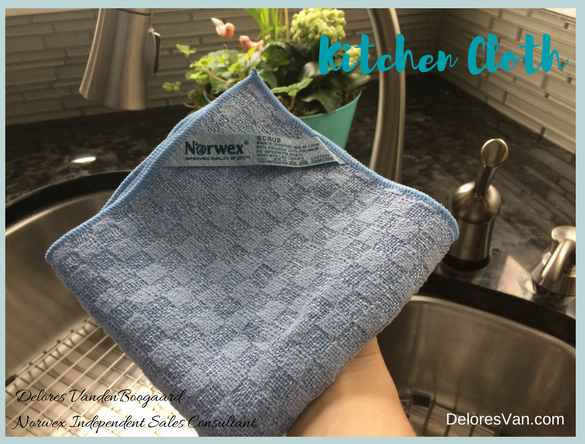 The special blend of nylon and Norwex’s microfiber does not scratch surfaces, not even teflon or tile. If you like it in the kitchen, consider getting a second one for your bathrooms. This is the best tool to maintain all the hard floor surfaces in your home. It is one of my top-selling products because it cleans your floor quick and easy without chemicals. When your party sells $550, you will receive the Telescopic Mop Handle, Small Mop Base, Small Wet Mop Pad with Baclock™ and a Small Dry Superior Mop Pad for FREE. When your party sells $750 you will receive the Large Mop Base, Large Wet Mop Pad with Baclock™ and Large Dry Superior Mop Pad. The Large Mop Pad is perfect for large living spaces in your home and the Small Mop Pad is perfect for smaller areas like your camping trailer or even if you are cleaning your bathroom floors. You now know that residential dwellings contribute to global pollution more than industry does. That piece of information gives me another reason, besides my family’s health, to choose eco-friendly cleaning products. The Host Rewards makes filling your home with safe, efficient, non-toxic products easy. 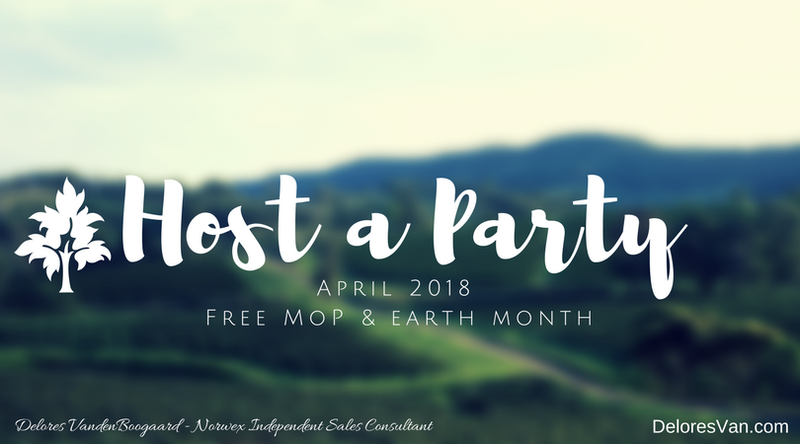 This April, host a Norwex Party, earn a Free Mop and start a fantastic Earth Day tradition. What do you do on Earth Day? Let me know in the comments.